Here's what I use. If you buy or subscribe through the links below, you help to motivate me to work more. I write almost everything in MultiMarkdown, including emails. You can see how I keep track of notes in my Macworld article "How I organize everything with plain-text notes"
Is hosted on Webfaction. They are awesome. 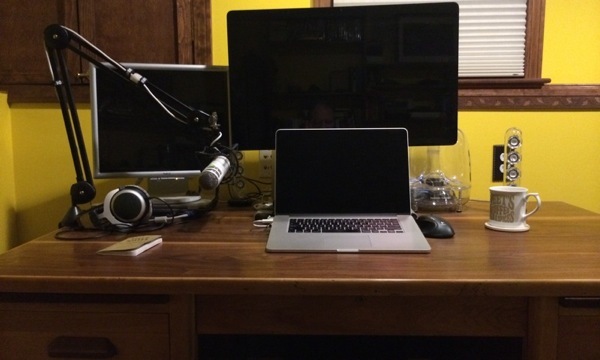 I use a Retina Macbook Pro with a 27" Thunderbolt Display and a Logitech Thunderbolt Dock. I use Backblaze because it is fast and doesn't kill my CPU. Most posts are written in a combination of nvALT, MultiMarkdown Composer and Sublime Text. I ocassionally use TextDrop for writing when I am away from my Mac. I have a Hazel rule that monitors my "notes" folder on Dropbox. When a new "@post" tag is added, the file is uploaded to my Pelican server. You can read more about it in this article. When I write on my iPad, I always use Editorial. You can read my full review here.